Both Spotify free and Spotify premium users can't convert Spotify to MP3 directly because Spotify is a streaming music service with DRM protection. However, there are several free Spotify music converters you can use to convert Spotify to MP3. The free programs search the song from online music libraries and download the songs when they are available. But when the songs are not available, you will encounter download failure. That's why we also introduce TuneMobie Spotify Music Converter whicn can work with Spotify and directly convert Spotify to MP3/M4A with music information kept. Many Spotify users want to download their favorite Spotify songs, albums or playlists as MP3 so that they can play them on iPod Nano/Shuffle, Sony Walkman or MP3 players. However, Spotify Free doesn't allow offline download and Spotify Premium only downloads DRM protected Ogg Vorbis files. That's why so many Spotify users want to find a Spotify to MP3 converter. And Some of them prefer to using freeware. In this post, we will introduce three free Spotify music converters which can download a part of Spotify songs from other sources instead of Spotify. AlltoMP3 is standalone software program developed by Ntag. 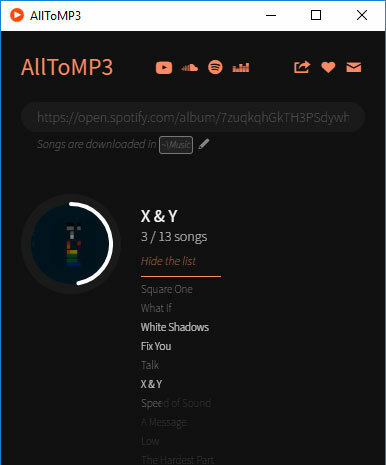 AlltoMP3 is available on Windows, Mac and Linux and can be used to download Spotify songs, albums and playlists as MP3. Besides, AlltoMP3 can also download songs from YouTube and SoundCloud. The music information like title, artist, album, genre and artwork will be preserved and the audio quality is 256kbps. As a free Spotify music converter, AlltoMP3 doesn't work with Spotify. 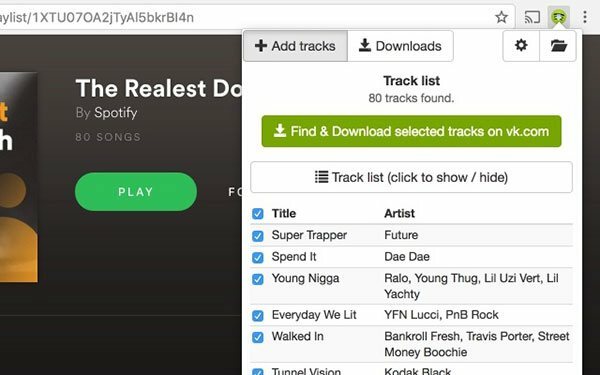 In fact, AlltoMP3 analyzes the Spotify link and retrieve music information of each song, then search the song in online libraries. When the song can matched, AlltoMP3 will start downloading the song. However, Spotify has more than 45 million songs, it's impossible that online libraries will keep such a huge number of songs because of lawsuit problems. To download Spotify as MP3, just copy the link to its address bar and press enter key to start. Click "See the list" to see all the songs in the album or playlist and you can see AlltoMP3 displays the downloaded songs, downloading songs and un-downloaded songs in different colors. If necessary, you can also change output folder before downloading. AlltoMP3 is totally free and clean, however, only a part of Spotify songs can be matched and downloaded. It's especially useful for downloading the old songs. When it comes to downloading new songs, you may encounter downloading failure a lot. You can get AlltoMP3 from https://alltomp3.org/ or get its source code from Github. Spotiload is a free extension designed for Google Chrome browser, it was formerly called Spotify VK Downloader. Spotiload is used to search Spotify songs from vk.com because VK users can upload their own MP3 songs to VK.com's server and rename the songs as they like. You can copy your favorite Spotify playlist into Spotiload, and Spotiload will get all the names of the songs in the playlist and search the songs available on VK.com. When the song names are matched, the songs can be downloaded. Spotiload requires a VK.com account. If you don't have one, create one with your email address or associate with your Facebook account. To download Spotify playlist as MP3 with Spotiload, just copy your favorite playlist link from Spotify web player, go to vk.com and login your account, go to Spotiload, click "Add tracks" button and matched songs will be listed, then click "Find & download selected tracks on vk.com" button to start downloading the songs. Using Spotiload as free Spotify music converter, only parts of the songs can be matched on VK.com. What is more, there are some other problems you may not want to encounter. VK.com may be blocked or illegal in some countries, or you don't want to create such a social network account. Some songs have the same names but they are different songs indeed, or some VK users may rename the songs casually. Music information may be lost and sometimes audio quality is quite low. You can search "Spotiload" or "Spotify VK Downloader" in Chrome extension store or open "Spotiload extension page to install it. Spotify Deezer Music Downloader is also an free Chrome extension, and it simply adds a Download button in each song for web players of both Spotify and Deezer. 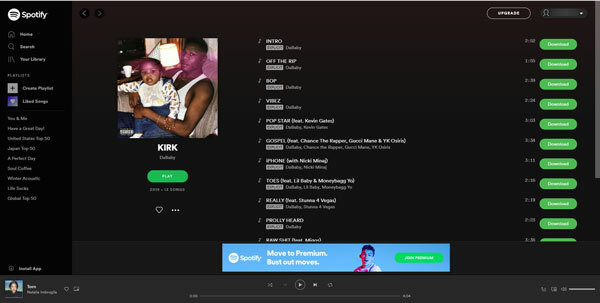 After installing and enabling it, you can open Spotify web player and login your Spotify account, open an album or a playlist and you will see there is a Download button for each song. Simply click Download button to start downloading the selected song. You will have to click each Download button one by one, as there is no easy way to click a button to start all the downloads. When a song has been successfully downloaded, the text on the button will be changed to "100%". However, Spotify Deezer Music Downloader also matches Spotify songs with online libraries, you may also encounter download failure problems a lot. 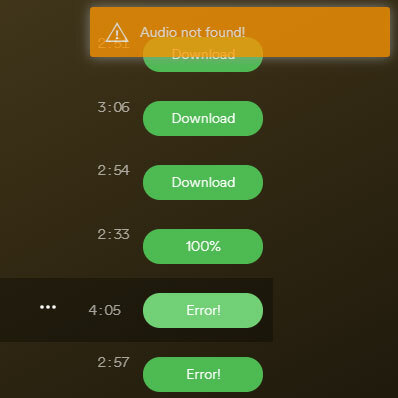 When a song can't be matched, Spotify Deezer Music Converter will show you an "Error!" button and popup message "Audio not found!". You can get this extension by search "Spotify Deezer Music Download" in Chrome extension store or open extension page to install it. When using free Spotify Music Converters mentioned above, you may encounter various problems because all of them don't record or downlaod songs from Spotify directly. To download any favorite Spotify songs, the professional Spotify Music Converter from TuneMobie Software is absolutely a better choice. TuneMobie Spotify Music Converter is designed for all Spotify subscribers. It can work with both Spotify free and Spotify premium. With this program, you can downlaod Spotify songs, albums and playlists to MP3, M4A, WAV or FLAC. All ID3 tags like song title, artist, album, genre, track number, artwork, etc. will be preserved. By default, TuneMobie Spotify Music Converter download Spotify songs as high-quality 320kbps MP3. However, you can also change output format and output quality according to your need. On Windows, TuneMobie Spotify Music Converter works with both standalone version and Windows Store version, allows you to convert a batch of songs at 5X speed. You can also uncheck the songs you don't want when downloading an album or a playlist. 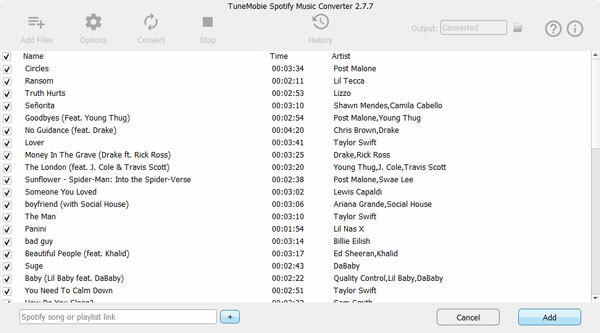 TuneMobie Spotify Music Converter is intuitive and easy-to-use and available for both Windows and Mac OS X, and it's fully compatible with latest Windows 10 and macOS Mojave. The free trial version will convert 3 minute of each song, download it to have a try now! 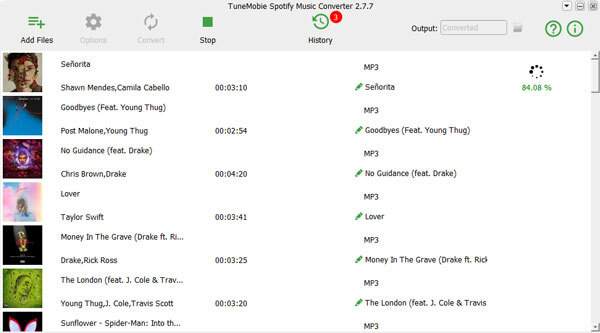 Using TuneMobie Spotify Music Converter to download Spotify songs, albums or playlists as MP3 files only needs a few clicks. Step 1: Launch Spotify Music Converter and Spotify will be launched automatically. Do not close Spotify when using the program. Step 2: Click "Add Files" button first. Then you can drag a song, an album or a playlist from Spotify and drop to Spotify Music Converter, or right-click on a song, an album or a playlist, click Share to copy the link, paste in the blank bar and click + button. Step 3: Spotify Music Converter will list and check all the songs. If necessary, uncheck the ones you don't want to download. Step 4: Spotify Music Converter uses 320kbps MP3 as default output. If necessary, you can click Options button to change output folder and output format. For Windows, 5X faster conversion speed is supported. Step 5: Click Convert button to start conversion. Downloaded Spotify songs can be easily found in History. 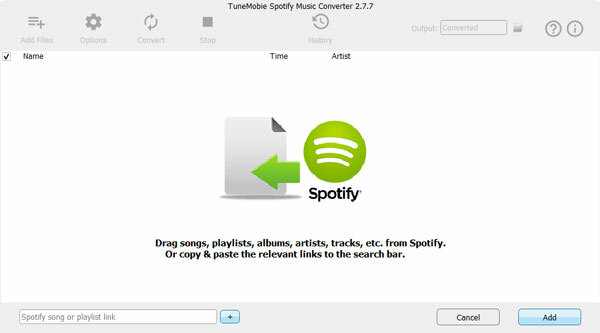 TuneMobie Spotify Music Converter works with Spotify, record and download songs, albums and playlists from Spotify application directly. So any songs available on Spotify can be downloaded. Besides, Spotify Music Converter can simply preserve all music information and save high quality audio files for you, so all the problems which you encounter when using free Spotify music converters will be gone. TuneMobie Spotify Music Converter is not free, but it provides flexible license plans including 1-year, lifetime and family. Besides, TuneMobie Software also provides several ways for users to get a free license. If you are not satisifed with the free Spotify music converters we introduced above, then you should never miss TuneMobie Spotify Music Converter. Just have a try now!